In 2015, Historic England commissioned Wessex Archaeology Coastal & Marine to undertake a two year project to assess underwater sites: Archaeological Services in Relation to Marine Protection. Similar to the Heritage at Risk project, which ran from 2013−2015, Historic England selected sites of special interest in English Waters for archaeological investigation. Sites ranged from wreck sites identified through the Early Ships and Boats Project to First World War submarines. Other wreck sites selected for investigation had been identified by Wessex Archaeology during previous fieldwork. Still others were identified by the seabed explorations of the Shipwreck Project with Grahame Knott and Richard Bright-Paul, a not-for-profit Community Interest Company based in Weymouth, that worked closely with Wessex Archaeology during the archaeological assessment of a number of sites. The project aims to archaeologically assess wreck sites on the seabed and intertidal area not only through intertidal walkover surveys, diver surveys and/or geophysical survey, but also through working with other organisations, and establishing links with local divers, dive groups and other stakeholders. Existing data, ranging from diver reports to listings in the National Record for the Historic Environment (NRHE), and from previous survey reports to recently acquired geophysical survey data are consulted and reviewed to inform fieldwork objectives. The objectives for each site are site specific. However, in general, the site’s location is confirmed, material within the site is investigated and accurately positioned, and the stability of the site is assessed. From this, a record of the site is produced, including photographs, videos, site plans, and a detailed report. For the Archaeological Services in Relation to Marine Protection project, the archaeological assessment of geophysical survey data played a key role in confirming the wreck sites locations, gaining understanding about the condition of the wrecks sites, and informing diving investigations. For some wreck sites, Wessex Archaeology’s geophysics team took to the water to gather the required geophysical survey data. However, for other wreck sites, existing data was processed and archaeologically assessed. Geophysical survey data included sidescan sonar, magnetometer, and multibeam. Wessex Archaeology’s Salisbury-based dive team investigated the wrecks identified by Historic England for archaeological assessment. Based on an initial assessment of the wreck site location, depth, conditions on site and access, Wessex Archaeology’s experienced dive team determined the most appropriate method of investigation. Diving was undertaken using either surface supply equipment, with air as the breathing gas, or scuba equipment with air or nitrox. Communications between the surface and the diver or divers on the seabed were maintained with either hard-wired comms or through-water comms. 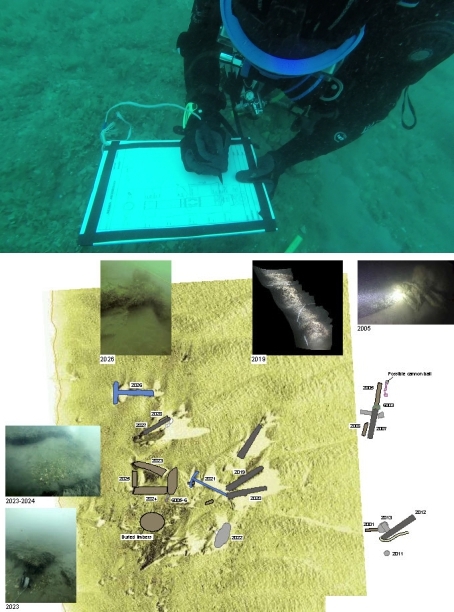 An integrated diver tracking and recording system, supported the dives by accurately positioning and documenting archaeological material visible on the seabed. Different objectives were identified for each site, but in general, surveys involved confirming the position, extent, state of preservation and character of the site, and providing accurate positions for material visible on the seabed. Sites of unknown date with wooden wreck structure exposed were identified for dendrochronological analysis and timber samples were recovered and sent to the Historic England Scientific Dating Team for further assessment. The condition of each site is illustrated through photographs, photogrammetry models, videos, site plans, GIS data and a detailed report. Each site is then carefully reviewed, based on professional experience, with regards to its importance and level of risk, and recommendations for further work, research, or options for protection are developed. In 2015, Wessex Archaeology assessed the condition of a number of hulks, recorded in the hulk inventory published by the Society for Sailing Barge Research in 1996. The hulks were adjacent to the River Swale, in Oare Marshes, Conyer Creek and Milton Creek, near Faversham, Kent. The work began with a walk-over inspection to confirm the location of each site. Then a visual inspection was undertaken, followed by a closer visual inspection and measurement of a limited number of site features. An RTK GPS survey was undertaken for selected site features. In addition, a complete photographic survey was undertaken for photogrammetry. Photogrammetry is an extremely rapid and cost effective method of survey that produces an excellent 3D visualisation tool, and very accurate survey data that can be used to assess changes in the condition of the site over time. Kestrel was registered as a 36 ton (110 gross ton) wooden spritsail sailing barge, built in Halstow by Ambrose Letley in 1896. It was owned by Eastwoods, a brick making firm operating in the 19th and 20th centuries, situated in Conyer Creek, off the Swale near Faversham, Kent. Kestrel had a 36,000−40,000 brick capacity, but in 1948, it became a mud lighter, and then was abandoned as a hulk in 1953 following a disastrous flood. 26.4 m in length from stem to sternpost, with a maximum beam of 4.8 m. Considerable wreck material is exposed, including frames, cant frames, and several strakes of outer carvel planking. The Kestrel is an example of an important regional vessel type of the 19th and early 20th centuries, popularly known as the Thames Sailing Barge. The U8 site is situated in a busy shipping channel off the coast of Kent. Expensive safety requirements made commercial diving on the site impractical. In addition, it made it difficult to use conventional towed geophysical equipment. Therefore, an Autonomous Underwater Vehicle (AUV) survey was undertaken instead. The AUV collected geophysical data, and was equipped with a GoPro camera to record video footage, however the height from the seabed at which the vehicle had to be deployed, combined with low visibility on site, meant that the video captured was not suitable for archaeological purposes. However, the pseudo-sidescan sonar data, marine magnetometer data, and multibeam bathymetry data were archaeologically assessed by marine geophysicists at Wessex Archaeology. Analysis of the geophysical data from the AUV survey and comparison with U-boat plans and photographs taken by previous diver surveys proves that this wreck is SM U8. U8, the earliest German U-Boat casualty of the First World War, was lost off South Varne Buoy in the English Channel. The archaeological assessment included a marine geophysical survey, consisting of sidescan sonar and magnetometer, undertaken by an Autonomous Underwater Vehicle (AUV). The surveys revealed a relatively intact wreck, sitting upright on the seabed with the conning tower, up to three periscopes and the radio mast still in place. Assessment against non-statutory criteria for designation determined the wreck was highly to extremely valuable. Following the archaeological assessment, Historic England advised the Secretary of State for Culture, and the wreck was given protection as a Protected Historic Wreck site. An archaeological marine geophysical survey was conducted over the reported possible location of the UB12 wreck site off Ramsgate. The side scan sonar and magnetometer surveys revealed a very large magnetic anomaly, indicating the presence of a large amount of buried ferrous material, just 11 m south-west of the UKHO’s recorded position of UB12. In addition, 10 further geophysical anomalies of possible archaeological potential were identified in the area. However, the work undertaken so far was not able to confirm whether the site represents a wreck site, and the size of the magnetic anomaly appears to be too small to correspond to the UB12. HMS D5, a British submarine lost off Lowestoft in 1914. Wessex Archaeology conducted a two stage archaeological investigation at this site. The first stage comprised a geophysical survey over the location of the wreck site aimed to confirm the presence of the wreck and to inform the second stage, a diver investigation. The diving survey assessed the wreck on the seabed, and recorded the site using still photographs and video.